We’ve been thinking an awful lot about experiential education here at Alt Ed Austin lately, and maybe you have, too. Unfortunately, as my daughter moves through high school, there seem to be fewer and fewer opportunities for the sort of amazing outside-the-classroom experiences she had as a little girl. That’s unfortunate because many teens are desperately searching for inspiration for future careers and for their own creativity. And that’s part of what experiential education is all about. As students get older, the rules and expectations for teachers increase, and it becomes more difficult to request funds for extra enrichment like they would find at ANSC. Students and teachers have to worry about passing tests. And buses often are spoken for by band directors and athletic coaches. But we do sometimes have older students who come on their own to work on science projects and papers, and our staff members are happy to help them. What are some of the programs students respond to most enthusiastically? Well, we’ve done our Wild about Wildlife for 40 or 50 years! Nothing connects a child to nature like touching a snake or a bunny or a cockroach. Those are instantaneous connections that are not forgotten. 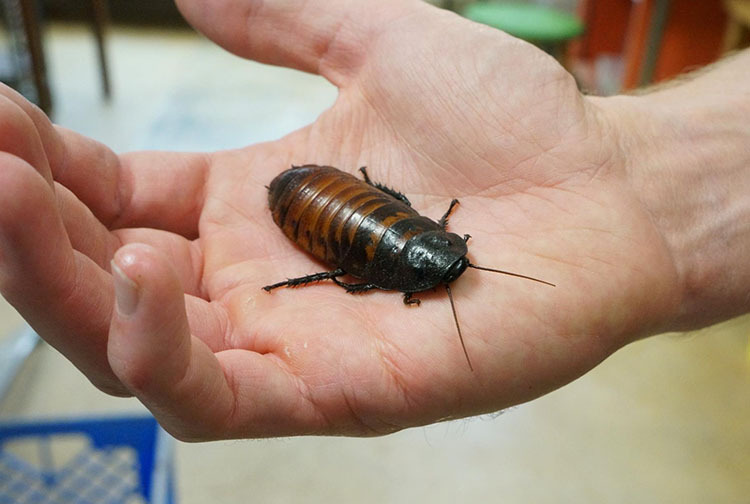 We have some staff members here who vividly remember coming as first-graders to see the cockroaches! It has evolved over that time, of course, and now it’s about an hour-and-a-half program where students rotate through stations where they can touch and learn about live mammals, birds, and reptiles. They also see and hold pelts, skins, and skulls. Older children begin to learn about evolution and adaptations of animals to their environment. Other programs during the year involve geology and fossils, astronomy, and aquatic ecosystems. We try to follow the standard curriculum topics so that we can support what teachers are doing in their classrooms with our hands-on experiences. What’s the role of your staff of educators? What’s most important is that they connect with the children as quickly as possible. We stage the environment so that happens: Everyone—staff and students—sits on the floor at first, in a horseshoe shape—“crisscross applesauce” style—so that our educators can make eye contact with every student. We want to create a comforting atmosphere so kids aren’t intimidated by someone towering over them. We say hello and start chatting about the animals or geology, and soon the kids are enamored. The key for us is to have people who love teaching. Many of them begin with us and then go on to school settings. They all have undergraduate or masters degrees, some in the sciences and some in other subjects, but all of them spend time in intensive training before they begin. And they are involved in experiential studies too, just as the students are. They go to the Hill Country to dig for fossils. They get their own hands-on experience learning about reptiles, plus discussions with experts from around the state. They are lifelong learners—just as we want the kids to be. How do you know what level the children are at in their science knowledge? We ask a few questions and let them ask questions so that we quickly understand where they are, then we start “coaching” them while they’re handling the animals or the rocks or other materials. We help them realize that they can understand a lot just by observing, touching, and listening. We ask them to compare skulls and see if they can suggest reasons the coyote has a long skull and a snout that’s very different from a rabbit’s or a human’s, for example. Can any child, including one with some special needs, have a good experience at ANSC? We make all our programs inclusive now. It’s a process we’ve been working on for the past 8 or 10 years. We provide extra staff and help for children who may be on the spectrum. We have a staff member who is learning American Sign Language, and several special programs for students who are hearing- or sight-impaired. This is a priority. Do you have many homeschooled children visiting ANSC? Yes! Hundreds! We have a monthly homeschool program that lasts four days, and that includes children from preschool through high school. We do such a variety of programs, and our staff are so good, that even if children end up in a classroom setting when they’re older, their parents bring them back for the homeschool events! And finally, do you have a philosophy related to the kind of educational experiences you offer at ANSC that you want to share with parents and kids? Mindfulness! As an educator my goal is to connect children and adults with nature and science. I believe that if you come to it mindfully, the connection will happen. Even a child who is afraid to go for a walk in the woods at first—with mindful attention that connection will happen. 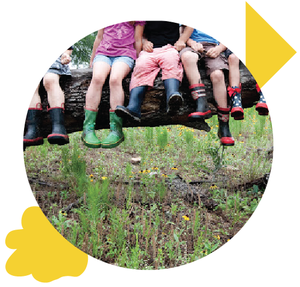 I recently happened upon a beautiful photo essay by Morna Harnden on some of the ways experiential learning takes place at Austin Children’s Garden. She has kindly granted Alt Ed Austin permission to publish excerpts here. 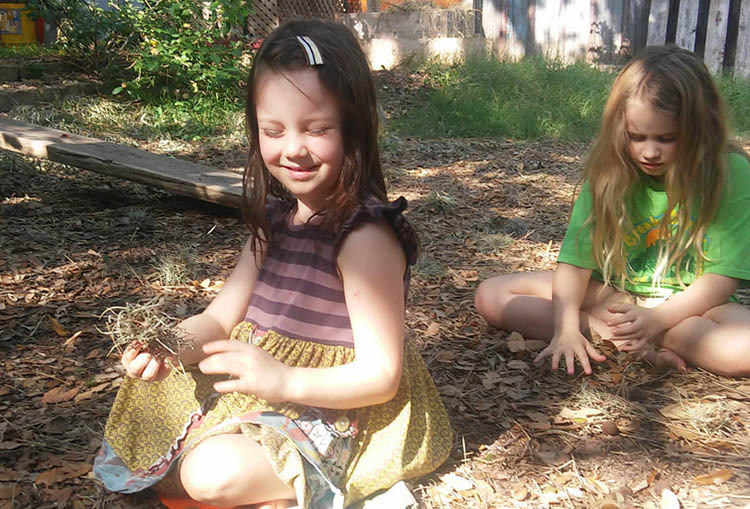 Morna is a co-founder and co-teacher there, along with her husband, Ben Harnden, where they offer a variety of preschool programs as well as elementary-level homeschool science classes in South Austin. Children use their senses to explore and try to make sense of the world around them. They do this by touching, tasting, smelling, seeing, hearing, and moving. We love to provide opportunities for children to actively use their senses as they explore their world. “Sensory play” is crucial to brain development—it helps build nerve connections in the brain’s pathways. This leads to a child’s ability to complete more complex learning tasks and supports cognitive growth, language development, gross motor skills, social interaction, and problem-solving skills. To start off our unit on the senses, we searched out our first Sit Spots. (We first learned about Sit Spots from Earth Native Wilderness School. If you haven’t had a chance yet to check out Earth Native, you must! They have amazing camps, preschool programs, workshops, and more!) In our Sit Spots we focused on our senses and discussed all the different sensations we experienced. We planted a garden for each of the five basic senses! 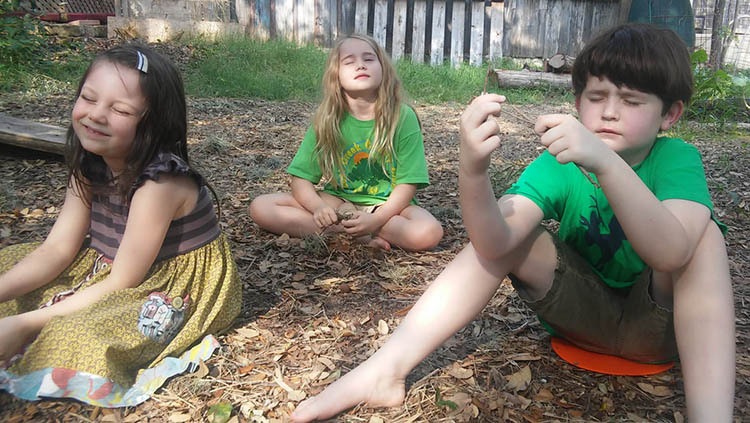 The kids dug their own holes with a spoon and learned how to gently loosen the roots of the baby plants before planting. 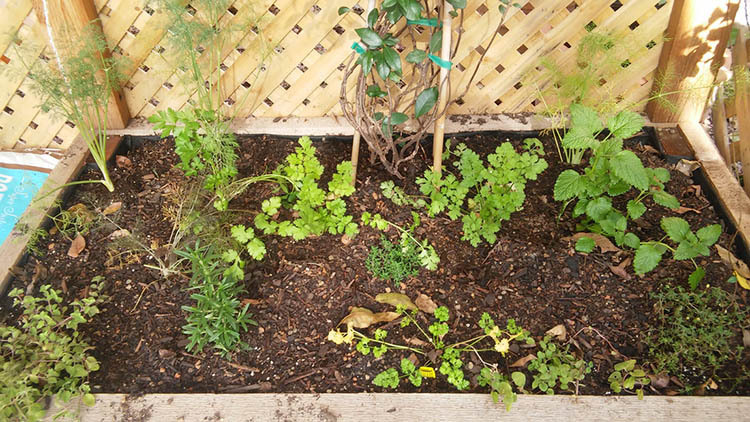 In our Listening Garden, we planted grasses and plants with crispy leaves that make interesting sounds. Adding wind chimes and windmills enhances the listening quality of the garden. In our Touch Garden, we planted a variety of plants with soft leaves and interesting textures, including rubbery succulents. In our Sight Garden, we planted edible flowers with all the colors of the rainbow! 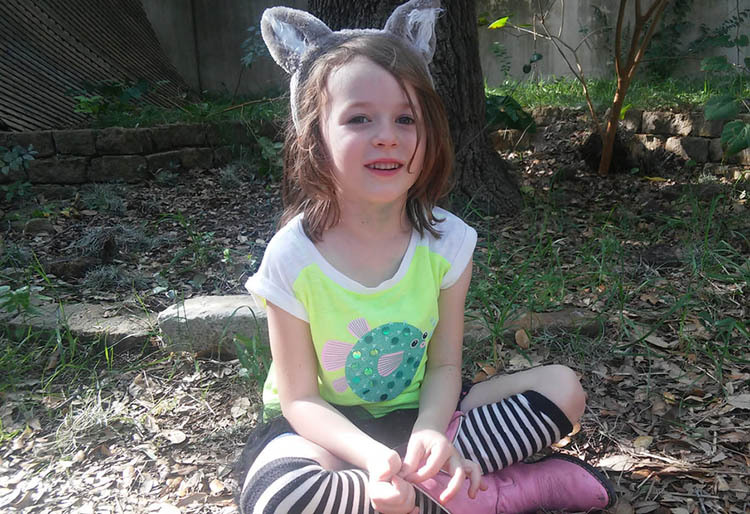 For an extended version of this article—including recipes for salt-preserved herbs and spice-scented play dough, instructions for “Easy Peasy Tie-Dyed Socks,” a scientific explanation of why mud pies make you happy, and much more—visit Morna’s original post on the Austin Children’s Garden blog. And don’t miss ACG’s upcoming events on Saturday, December 9: an Open House, including a free children’s yoga class, from 2pm to 6pm (RSVP to austinchildrensgarden@gmail.com); and a Kids’ Night Out from 3pm to 7pm, where children aged 3 to 10 will create their own candles with crayons and beeswax (tickets and more info available through Eventbrite). Educator and community organizer Rachel Green Soto is best known as the founder, director, and teacher of Verona Schoolhouse, a pre-K and kindergarten program in southwest Austin; founder and board chair of the nonprofit Kairos Ed; and founder and executive director of the new Synergy Middle School. Rachel returns to the Alt Ed Austin blog to discuss experiential learning, a mode of education at the center of the Synergy model. [E]ducation is not what the teacher gives; education is a natural process spontaneously carried out by the human individual. It is not acquired by listening to words, but by experiences upon the environment. intrinsically motivated by the experience. According to Wikipedia, “experiential learning is the process of learning through experience, and is more specifically defined as ‘learning through reflection on doing.’” Reflection is a unique element of experiential learning that takes an experience to a whole new level. It is the key to connecting one experience to future learning and experiences, rather than seeing it as a stand-alone event. What are other characteristics of experiential learning? Experiential learning takes individual involvement and time. One can’t rush an experience. One can’t force true learning. Through regular interaction in an experience, growth will naturally happen over time. Children don’t learn to walk simply by focusing really hard on the people around them who are already walking, paying close attention, and explaining how walking is done. Rather, they learn to walk by doing the walking . . . with support, with guidance, and with encouragement. Eventually, they will walk because they put that learning into their body, practiced it, and took the time they needed for it all to come together and make sense. Experiential learning puts its focus on the process rather than the product. Just think of a piece of art. Whether or not it turned out just as it was intended, the experience of doing the work provided growth opportunities that will be built upon the next time. Experiential learning connects the pieces and creates opportunities for everything to make sense. When I studied abroad in high school and college, many of the separate skills I had been practicing for so long, including speaking a second language, learning about cultures around the world, managing money, and reading maps, came together and made a whole new world of sense in the context of living in another country. I believe that without that experience, those individual pieces would have continued floating around, disconnected with anything real or meaningful. Experiential learning is multi-sensory. Research has shown that there is an important link between the brain and the body in learning. A multi-sensory approach helps take learning to a deeper level by engaging multiple senses, thus connecting more directly to the individual. Imagine how alive the life sciences could become for you if you were spending time in nature, with its sounds, smells, sights, and energy! Experiential learning is relevant and motivating. Too often students don’t understand, or can’t clearly explain, why they are learning something that is being taught, right? Many of us have wondered or been asked the question, “But when am I going to use this in the real world?” Now just imagine how motivated a student would be to understand accounting, communication, and writing skills if those activities were part of building their own business from the ground up. Connecting the foundational skills development and content learning to an authentic learning experience flips the script completely. When learners are invested in their ideas and excited about the opportunities, they are open to learning in a whole new way. Is your experiential learning authentic or vicarious? As you consider what experiential learning does or could look like in your learning environment, I encourage you also to think additionally about how to connect students to the learning in real, tangible, and motivating ways by making the learning not just experiential but also authentic. Experiential learning moves from vicarious to authentic when it goes beyond textbooks, beyond projects, and beyond the classroom walls to involve real-life skills, with actual deadlines, a real purpose, and results in useful interaction with a community. Real life is full of learning opportunities that, with intentionality, can enrich the foundation and application aspect of any learning environment, providing natural opportunities for deep and relevant learning and skill development. Middle schoolers learn by doing! At Synergy Middle School, we have redesigned the middle school experience with authentic experiential learning in mind. We are committed to providing a strong academic foundation of skills and knowledge in the classroom that is clearly relevant and motivating to students through its experiential application. Every week at Synergy Middle School is designed to weave academic, social, and experiential learning together in the minds, hearts, and bodies of middle schoolers. We are thrilled to be working with a strong team of skilled teachers in the classroom, expert educators on location, and a growing community of professional support providers that are enthusiastic and committed to creating and supporting a holistic learning environment where all students thrive through their participation in their learning. Maggie Duval wears many hats comfortably: event producer, web developer, futurist, alt educator, mom. In her guest post for Alt Ed Austin she shares the news about her latest project, STEAM3, the conference and “Interactive Playground” that is shaping up to be one of the most interesting events of 2014. GIVEAWAY: As part of Alt Ed Austin’s 2nd anniversary celebration, we have two pairs of Interactive Playground passes to give away—each good for one adult and one student. There are lots of ways to enter the drawing; you’ll find the entry form at the end of the post, along with a special discount code for all Alt Ed Austin readers who want to attend the whole shebang. Thanks, Maggie! I’m very excited about a new project I’m working on that weaves together my four great loves: alternative approaches to education (including STEM/STEAM), mining the brilliance that lives at the intersection of art and technology, futures studies, and emerging technology. Called STEAM3 (Science + Tech + Engineering + Arts + Math “cubed”), it will take place in early March and is the first public event of its kind to present a comprehensive look into the future of experiential learning. It will provide an interactive stage for the exploration and demonstration of the emerging approaches, formats, technologies, and learning models that will redefine education over the next decade. The buzz is huge around STEM in education, which focuses on bringing kids up to speed on science, technology, engineering, and math skills by masterfully blending holistic and cross-disciplinary approaches to teaching and engagement. However, many are finally acknowledging the importance of the arts in that equation, hence the “A” in STEAM. The “cubed” part comes from our desire to address the whole child, explore alternative approaches to education (which as a mom I’ve been passionate about since my own childhood), as well as engendering a positive, empowered approach to what’s coming toward us in the future. I have developed the event with professional futurist Derek Woodgate of The Futures Lab, who is also Consultant in Residence at the Digital Arts and Entertainment Lab (DAEL) at Georgia State University. I serve as CEO for two divisions of The Futures Lab, Inc., Learning Innovations in Future Education (LIFE) and the Future Entertainment and Events Lab (FEEL). The latter was formerly known as Plutopia Productions, Inc., which I also headed up, and we produced numerous “sense events” at SXSW Interactive and beyond. For this unique two-day event held in Austin, Texas, we’ve assembled some of the world’s foremost experts in the field of future education as well as the most innovative and immersive demonstrations and exhibits of emerging educational technologies in what we’re terming our “Interactive Playground,” featuring such areas as the Living Classroom, Make Magic, Interactive Storytelling, and the Game of Learning. Special panels and demos will address topics such as alternative approaches to education, avatars for learning, “education is art, art is education,” girls in engineering, and more. The family-friendly event is for parents, kids, and educators certainly, but also for artists, instructional designers, “makers,” instructors/trainers, content creators, mobile development designers, researchers, and more! And this is only the beginning of our journey. It will continue through a number of similar events that we are planning for Atlanta, Georgia; Belo Horizonte, Brazil; and Manchester, UK, as well as through an online post-event portal and virtual and in-person salons. There will also be talks and demos from MIT Media Lab’s Lifelong Kindergarten group, Nano Art by Cris Orfescu, Experimental Geography by Nato Thompson, and Algorithmic Art from Joel Kahn. And don’t miss Art, Technology, and Augmented Reality from Marvin Neibuhr and Dr. Bruce Niebuhr, Gamification for Learning by Billy Joe Cain, and Makerspace, a space for young children to learn about STEAM-oriented topics with Joseph Lopez, Head of Faculty of Convergent Media at the University of Incarnate Word in San Antonio. More information and tickets are available at steam3.com. Full Conference + Interactive Playground + VIP party tickets are priced at $99.95 until December 31—and Alt Ed Austin readers get an extra $10 off this special rate! Just use the coupon code ALTEDATX at checkout. Feel free to share with your friends. On January 1, the price goes up to $124.95. Interactive Playground–only tickets range from $7.50 to $25. This event is sponsored in part by The Futures Lab, Inc., Learning Innovations in Future Education (LIFE), Skybridge Academy, and ATX Hackerspace. Enter below to win one of two pairs of adult + student passes to the STEAM3 Interactive Playground on either day!